I've not been a breakfast person. I don't get hungry until about 10 or 11 am. By then it's almost time for lunch, a meal that comes at a much more civilized hour. I don't really like typical breakfast foods. There are very few cereals that don't have sugar as one of the top 3 ingredients, and in spite of my sweet tooth, I don't like sweet cereals. Not much into bread or bagels or foods you actually have to use a stove for. But I know, thanks to either science or to effective marketing by the cereal industry, how important it is to break the fast from the previous day. I finally found something I can stomach, that tastes good, and that delivers balanced nutrition: Balance Bars. Given my allergy to nuts, my favorite of the flavors available to me is Mocha Chip. Of the 200 calories, 30% are from protein, and 40% from carbs, so the bar helps service my muscle tissue and give me energy. I get a hearty dose of a bunch of other vitamins and minerals, without the taste of vitamins and minerals. High-fructose corn syrup is second on the ingredient list. 4 grams of saturated fat and 18 grams of sugars. If the bars get too close to their expiration date, they taste pasty. But still. How can you go wrong with chocolate and coffee? 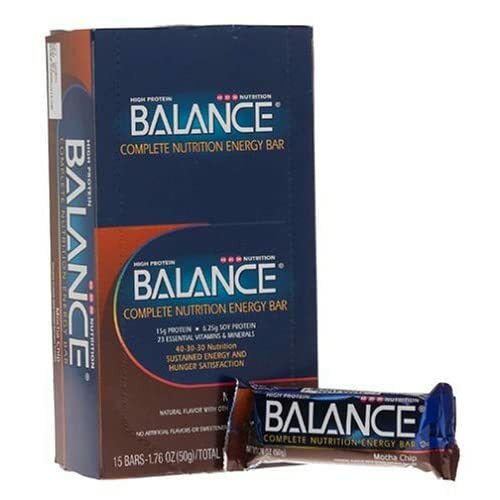 I buy Balance Bars by the box -- 15 last me 2 weeks --and the price is just over $1 per bar in bulk. If you have no dietary restrictions or if your tastes differ from mine, you can also choose other flavors like Honey Peanut, Almond Brownie, Cookie Dough, Chocolate Raspberry Fudge, and Yogurt Honey Peanut. Balance Bars -- they are almost worth waking up for. I like these but find them a little too blah cuz I like the sweet. So I eat the Vector bars, chocolate flavor - it's like a chocolate bar for breakfast, which is never a bad thing. I also have allergies to nuts and am always on the lookout for an affordable, tasty, convenient energy bar. Thanks for giving me the heads up on this one. I'll try it and let you know what I think.